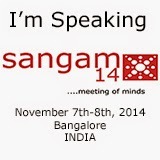 I am proud to announce that I will be Presenting a Session at Sangam 2014 this year in Bangalore India. Sangam is a yearly Oracle User Group Conference Hosted by All India Oracle User Group (AIOUG) and is the largest Independent Oracle event in India. The Session will be about Customizations and Personalizations of Applications using powerful XML based MDS framework provided by Oracle ADF. It will consist of introduction to Meta Data Services (MDS) and how MDS framework is enabled in ADF applications using Jdeveloper. There will be an explanation of how MDS works behind the scenes and how requests for Customizations are being persisted in MDS Store. Finally there will be a Demo of Personalization using Jdeveloper 12c. I am excited to talk about this topic @ Sangam14.